I finally got through my head that I was supposed to use a digi stamp for the Whoopsi Daisy Challenge, so you will actually find 2 digi stamps on this card. The Little Fairy Girl tending the flower is from Soft Pencil, she was one of the first digis I won and learned to use. The sentiment is from Doodle Pantry. Supplies: White Card Blank 4" X 5 1/2" Halcraft, Papers: White-Georgia Pacific, other papers unknown, Stamps: Softpencil, Doodle Pantry digis, Ink: Copic markers, CTMH-Z2161 Petal, Z2110 Buttercup, little gems unknown, sewing machine, pop dots. This is very sweet Beverly! 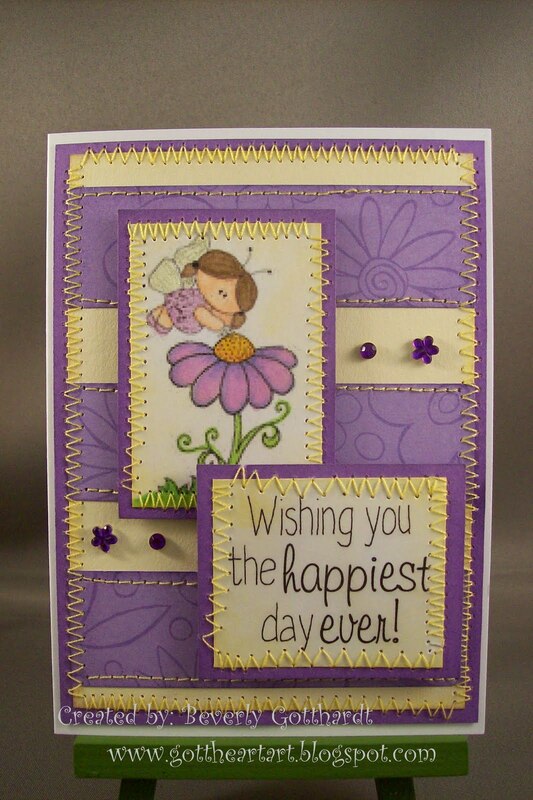 I really like the embossing and the dimension you added. Thanks for joining us at Tuesday Morning Sketches. what a great card, thank you for playing with AI Think INK! Your card is adorable!! I just love the image! Thank you for joining us for this months challenge at Whoopsi Daisy.